Both hold themselves well, and are politicians. But for the Vejjajiva cousins, the similarity ends here. Their paths have diverged. HANDSOME, articulate, 40-something, a politician and his name is Vejjajiva. Newly-elected Thai Prime Minister Abhisit Vejjajiva? No. The description is of Abhisit’s first cousin Suranand Vejjajiva. But that’s where their similarities probably end. Suranand and Abhisit are as dissimilar as Thai Rak Thai (TRT, the disbanded party headed by Thaksin Shinawatra) and Democrat Party (Thailand’s oldest party). Suranand, 47, who is among 111 TRT executives banned from politics for five years, is three years older than Abhisit, the leader of the Democrat Party. 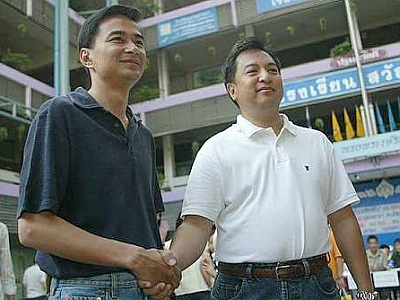 The military coup in 2006 that ousted the TRT government resulted in Suranand, then a minister in Thaksin’s government, having his political fortunes crushed, and Abhisit seeing his rise. The Vejjajiva clan are seventh generation Hakkas who migrated to Thailand from China through Vietnam and married into prominent Thai families. Suranand’s father is the older brother of Abhisit’s dad. “Our family is quite close although it is a large family – my father has seven siblings,” said Suranand, now a media pundit. When the Vejjajiva cousins were young, they took a different route. The Newcastle-born premier went through the British education system whereas Suranand (whose father was a roving ambassador, including to Malaysia) went through the American education system. Because of their different educational backgrounds and careers – after graduation Suranand went into government, business and politics, while Abhisit plunged into politics after a short stint as a lecturer – “we think differently”. “Not to discredit him. He is a well-intentioned man. He has good intentions for the country. He worked hard to become prime minister. And the Vejjajiva clan is proud that he became prime minister. But that is his world,” said Suranand. Asked about his relationship with Abhisit, with them on opposing sides, the now politically neutral Suranand said: “Of course, he is much more successful. He has been MP since he was young (27) whereas I joined politics much later (becoming MP at 40). How long will your cousin last as prime minister? I asked. He then spoke about the manner in which Abhisit’s government was formed (the Democrats is a minority party which managed to cobble together a coalition government – with the alleged intervention of the military – when the court disbanded the ruling government led by People Power Party, the reincarnated TRT). He also noted that with a budget session coming up during an economic downturn, the prime minister must be able to satisfy the pork-and-barrel demands from his party and coalition partners. “It’s a tough job,” he added. Asked whether Thaksin or Abhisit would make a better premier, Suranand said they were different people in different times. “Thaksin (who became PM in 2001) was appropriate for the post 1997 economic crisis,” he explained. “During that tough economic time Thailand needed a leader who was dynamic, possessed business skills and understood that the world was changing. “Is Abhisit appropriate for this time? Probably he is. Because Thailand needs someone with a fresh look, integrity and who is well versed in Thai politics. Will he benefit with a Vejjajiva as prime minister? The radio and TV talk show host’s boyish face then turned serious.